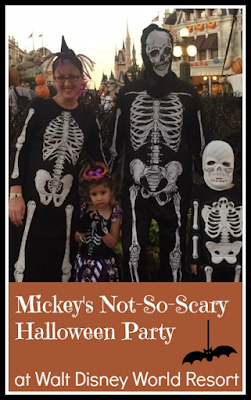 This year we were on holiday in Florida for Halloween, and we were lucky enough to be able to attend Mickey's Not So Scary Halloween Party at Disney World Resort. Mickey's Not So Scary Halloween party takes place in the Magic Kingdom on selected dates every autumn in the build up to Halloween, beginning at the beginning of September with the final evening taking place on Halloween itself. After 7pm, the park is open only to guests who have purchased tickets for Mickey's Not So Scary Halloween Party. Obviously the park will be full of other guests that have been there during the day, so to distinguish the Halloween party guests you are given a wristband to wear. It seemed a fairly efficient process to make sure that only guests with a wristband were left in the park after about an hour or so, with plenty of checkpoints at the entrances to different lands and before going on rides, as well as regular spot checks. On entry you are given a map with Trick or Treat locations and the show schedule as well as your Halloween treat bag. 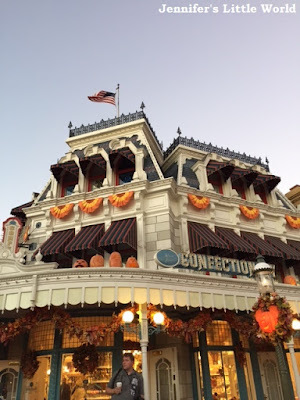 Disney World was already beautifully decorated in autumnal and fall colours, with lots of orange and red and plenty of pumpkins. 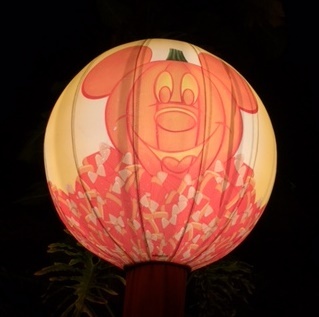 We noticed a few extra pumpkins that had appeared on the evening, like the large inflatable ones at the entrance, as well as special lighting, spooky smoke and projections. There were also lots of seasonal photo opportunities! About half the guests were dressed up, although not as many adults as children. 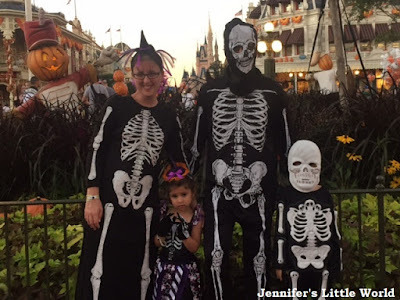 Most of the costumes were store bought or Disney character costumes, but there were a few more original ones as well as couples and families wearing matching or complementary costumes. Although it was very warm earlier on it did become cooler later, so it's important to remember different temperatures when planning a costume. You aren't allowed to wear costumes that obscure your vision and they aren't supposed to be too scary. Most people were in fancy dress rather than traditional spooky Halloween costumes. We decided to go as a family of skeletons and fortunately found matching outfits before we left home by raiding the local supermarkets. There were two character dance parties taking place, and we stopped for some of the Monstrous Scream-O-Ween Ball in Tomorrow land where the characters from Monsters Inc. were dancing away with guests. The music was pretty good too. There were two parades, one at 8.15pm and one at 10.30pm, and we watched the earlier parade. The park seemed much busier than during the day (perhaps because not so many visitors were busy with the rides but were instead walking about) so we quickly realised that we'd need to be in position for the parade quite early, and we were waiting at least half an hour before it was due to start. The parade was lead by a headless horseman which was pretty cool, then there were a series of themed segments - spooky characters based around the Disney Haunted Mansion ride, floats carrying Disney villains, a Harvest/fall dancing part and Halloween candy, with Goofy driving a huge candy machine. The parade was very good, although perhaps no more spectacular than the usual daytime parade. We usually find that Frontierland is a good place to watch the parades as it's not as busy as Main Street. Most of the rides were open and had minimal queues. The only ride we saw that was slightly different for the evening was the Haunted Mansion, where there was an actress in suitable attire outside entertaining the crowds along with atmospheric smoke and lighting. During the parade in particular the rides were empty (apart from the new Snow White Mine Train which always had a massive line!). When walking around though the park felt much busier than it had during the day. Not all the food venues were open, so it's probably best to check in advance if you are planning to eat a full meal at the park. We didn't buy anything to eat, but I saw that some of the venues were selling specialty food for the evening and there was plenty of snack food around to purchase like candy floss (cotton candy), ice cream and popcorn. You could also buy seasonal treats elsewhere in the parks around this time, I bought this lovely Halloween Minnie cupcake at Hollywood Studios later that week. We don't really go in for meeting the characters at Disney World as our children are quite shy and also it takes up a lot of time waiting in line. However I know that for many people this is the highlight of the party, as some of the characters are dressed in special Halloween outfits and there are also characters about that don't appear very often. 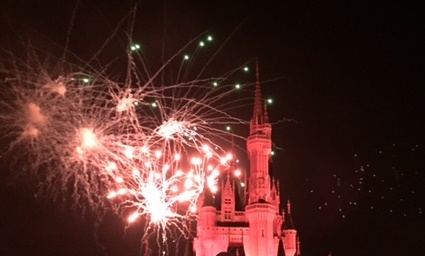 This show took place four times throughout the evening on the stage in front of Cinderella Castle. We stayed in the same position for this show, and Celebrate the Magic and Hallowishes which followed straight after. We didn't have a great view of the show unfortunately as we were behind a tree, but it was a good show with plenty of characters, music and lighting effects on the castle behind. At 9.15pm Cinderella Castle was decorated with projected scenes from Disney films alongside music for a spectacular show. This seemed to be the same show that is performed on non-Halloween nights, but we still enjoyed an extra chance to see it. It was a late night for us all, we stayed a little while after the fireworks finished and left around 10pm. Mia was fast asleep in her pushchair by this point! But fortunately we'd had a few days of the holiday already to accustom the children to staying up a little later than usual. As the park will be dark throughout the party you do need to be extra vigilant about keeping an eye on the children. It's a good idea to purchase some glow sticks or light up toys to attach to them, to make them easy to spot! 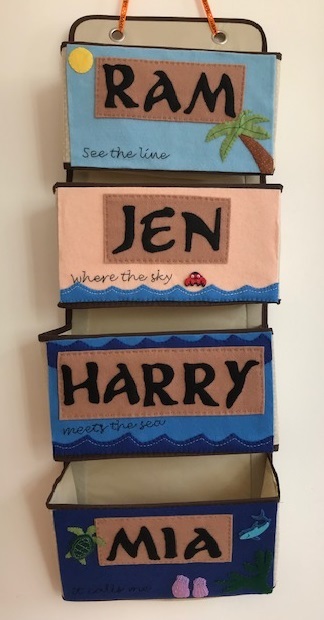 Of course there are plenty on sale at the park or you can take your own along. We visited on the 23rd October 2014, and posters said that there were still tickets available for that night. Closer to Halloween however we saw several sold out posters, including on Halloween night. Although the event starts at 7pm, the park actually opens to ticket holders at around 4pm, so you have a chance to take in some rides first and then I believe at 7pm you can collect your treat bag and wristband. Ticket prices for the 2014 event varied according to the date that you visited, with prices increasing nearer to Halloween, as well as discounts for annual pass holders and advance tickets. So prices ranged from $66.03 for an adult advance ticket purchased for September to $82 for an adult ticket on Halloween night, and you don't need to purchase separate admission to the park. You can see this year's ticket price details as well as loads more useful information and tips here). It's a pretty pricey night out, so you need to decide if it's worth it to you before booking tickets. Even if you are regular visitors to Disney World then it's a great opportunity to see a different side to the park. 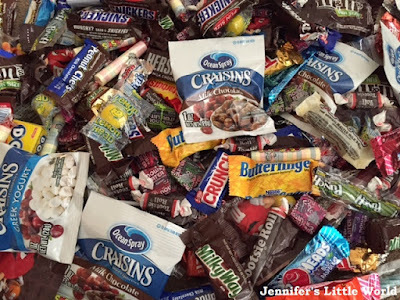 If you enjoy meeting the characters then there are many one off opportunities to meet and greet, and children (and adults) will enjoy taking home as much candy as they can carry. There really was a sense of something special taking place, and there was a fantastic and fun atmosphere throughout the park. We were lucky enough to receive complimentary press tickets to the party. For more information about Orlando see the Visit Orlando website. That looks amazing, I LOVE Disney World. We're going in April next year, I must check to see if there are any special events on. I'm not sure what other events they do through the year, I know that there is definitely a Christmas party, but it's worth checking as it was a fab night!